Jan Hawk (left), Lisa Wende, Veronica Wende and Mark Hawk enjoy a drink together at the Journey to the Red Carpet Gala for Lima Memorial held at the Lima Mall on Thursday evening. See more photos from the gala. 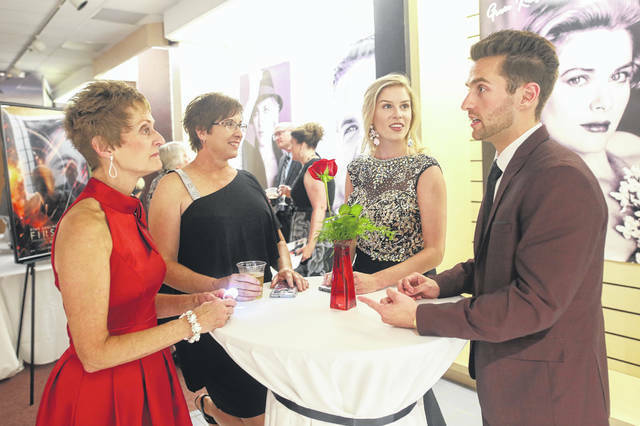 LIMA — The Lima Memorial Foundation expected to raise over $700,000 during the 17th annual Gala to Raise Funds to Transform Inpatient Rehabilitation event held at 5:30 p.m. Thursday at the Lima Mall. According to a press release, over 800 people were expected to attend the Hollywood-themed event. The guests would begin their journey through Hollywood beginning on the red carpet with all of the bright lights, to the back lot studies and finally to the Coconut Club. Guests held raised funds for inpatient rehabilitation by participating in silent and live auctions. “Through community support, we will transform the way care is delivered for patients who require intense rehab following a stroke, trauma, major injury or debilitating illness,” Mike Swick, Lima Memorial Health System president and CEO stated in the press release. Of the funds raised from the event, 100 percent will be used to support the inpatient rehabilitation program.